IT took a decade for Kathryn Bailey to find her voice and confront the brother who raped her for four years as a child. But as James Bailey stood shackled in a courtroom and was sentenced to 32 years jail, Kathryn, now 23, tearfully but firmly shifted the blame squarely where it belonged: to him. 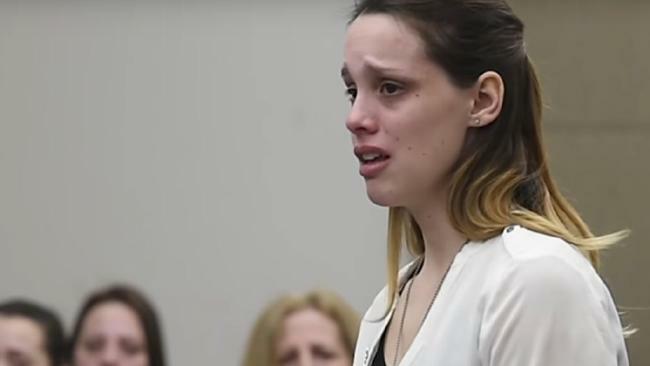 She began by asking the judge could her 31-year-old brother "look at me? ", Syracuse.com reports. He remained expressionless as she read a lengthy statement, in video captured by Syracuse.com. This is an excerpt of Kathryn Bailey explaining to her brother, James Bailey, in Judge Dougherty's court what he did and how it has affected her. Her voice, like her hands, was shaking: a mix of emotion, scorn and anger. She sniffed tears away. But she stood tall and looked him in the eye. "The anger I placed on mum and dad was wrong of me," she told him in a New York courtroom. "This should have all been placed on you. They trusted you to take care of me. "It was sexual abuse, it was not curiosity. Do you really think so little of what you did to me? "You try to blame your substance and alcohol abuse on dad, but in reality, James, it was your mind dealing and processing with your guilt. "Can you stand to look at yourself? Probably, but I really don't care." James Bailey was found guilty of two felony counts of sexual abuse after assaulting Katie repeatedly for four years, beginning when she just was nine years old. The court heard at the age of 17, he was responsible for most of Kathryn's care because their mother worked long hours and their father's job meant he travelled frequently. Kathryn, who waived her right of anonymity so she could confront her brother, was subjected to multiple rapes at the hands of her brother and grappled for another decade with the fallout before she revealed it. "How does possibility of 32 years sound to you?" she asked. "That's 11,680 days and 280,000 hours. I'm positive that number will matter to you." She was incredulous and angry over her brother's one-word answer for the what motivated his abuse: "curiosity". The response, Kathryn revealed, devastated her all over again. "Just when I thought the memories and the way I felt were enough to make me cold and numb inside, you managed to damage and hurt me again," she said. Her brother got 32 years, and she reminded him "however long I live I will have a life sentence". "I have the rest of my life to bear this weight of the abuse. And that is that. I will never forget what you've done to me. I will never forget how I felt through those dark days." But she said she does not hate him. "I suppose a goodbye is in order, but I'd like to say one last thing," she said. "I don't hate you. I hate what you did."